Internationally renowned as the ambassador-at-large to the world's oceans, Sylvia Earle is an extraordinary woman--the former chief scientist of the National Oceanic and Atmospheric Administration, a distinguished marine biologist, a veteran of more than 6,000 hours underwater, the founder of an ocean engineering firm, and an eloquent advocate for marine conservation. Sea Change is at once the gripping adventure story of Earle's three decades of undersea exploration, an insider's introduction to the dynamic field of marine biology, and an urgent plea for the preservation of the world's fragile and rapidly deteriorating ocean ecosystems. Earle takes us along on journeys to places of unimaginable beauty and unutterable destruction. She conjures up the exhilaration of swimming with humpback whales off the coast of Maui; she makes us comprehend the true environmental tragedy of the massive oil spills in Prince William Sound and the Persian Gulf; and she leads us out into Australia's Great Barrier Reef, the epitome of ocean wilderness but also the final resting place for tons of waste that drift in from thousands of miles away. 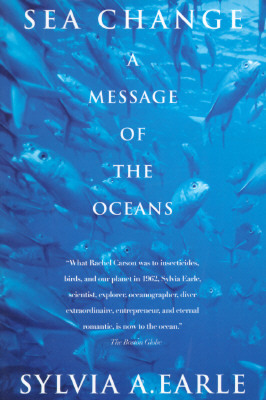 This brilliant, thought-provoking, superbly readable book will inspire a new reverence for the majesty of the world's oceans even as it opens our eyes to the intricate interdependence of all life-forms. Called "Her Deepness" by The New Yorker and New York Times, Sylvia Earle is a marine biologist, author, lecturer, and scientific consultant, chairman of Sea Change Trust and the Caribbean Marine Research Center, co-founder and director of Deep Ocean Engineering, Inc., president of Deep Ocean Exploration and Research, Inc., director of Dresser Industries, Inc., and formerly the Chief Scientist of the National Oceanic and Atmospheric Administration. Currently, she is Research Associate in Botany at the Smithsonian Institution. Her research concerns the ecology of marine ecosystems, with special reference to marine plants, and the development of technology for access and research in the deep sea. Holder of several diving records, author of more than ninety scientific, technical, and popular publications, Dr. Earle has a B.S. from Florida State University, and M.A. and a Ph.D. from Duke University, and six honorary doctorates. She lives in Oakland, California, and in oceans everywhere.